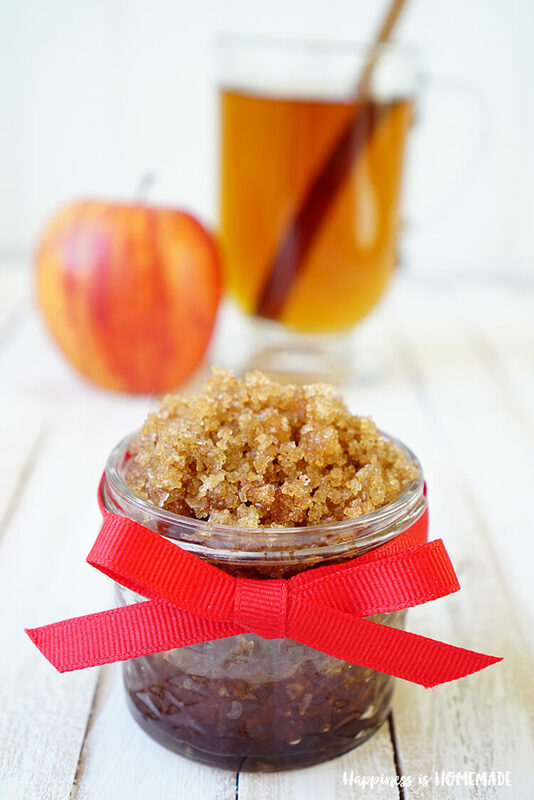 This Spiced Apple Cider Sugar Scrub only takes a few minutes to make, and it smells just like fall. Keeps your skin smooth, soft, and smelling amazing! Makes a great DIY homemade gift idea! The smell of fall is in the air, and my favorite fall fragrances are apple cider and pumpkin pie! 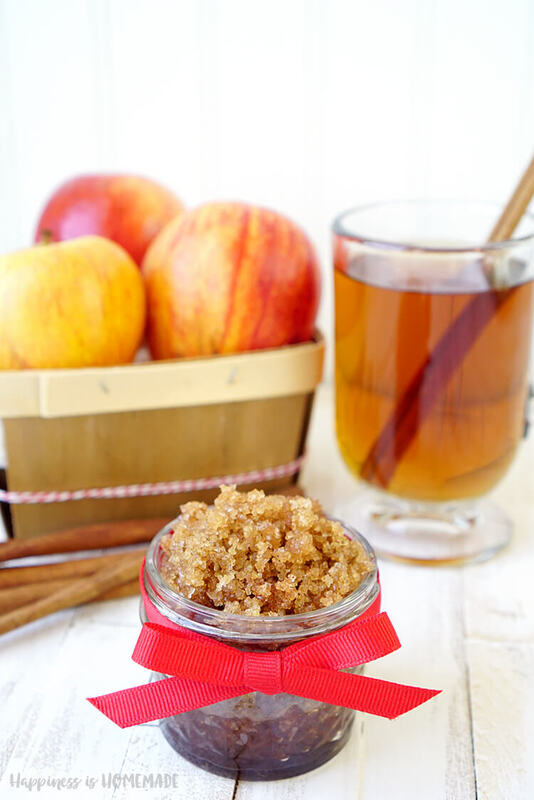 In previous years I’ve shared my 10-minute tutorials for Pumpkin Spice Soap, Apple Pie Soap, and Vanilla Pumpkin Spice Sugar Scrub, so this year I decided to add a quick & easy Spiced Apple Cider Sugar Scrub to the repertoire! Sugar scrubs are fantastic for keeping skin moisturized and exfoliated, especially as the season’s weather turns colder and drier. 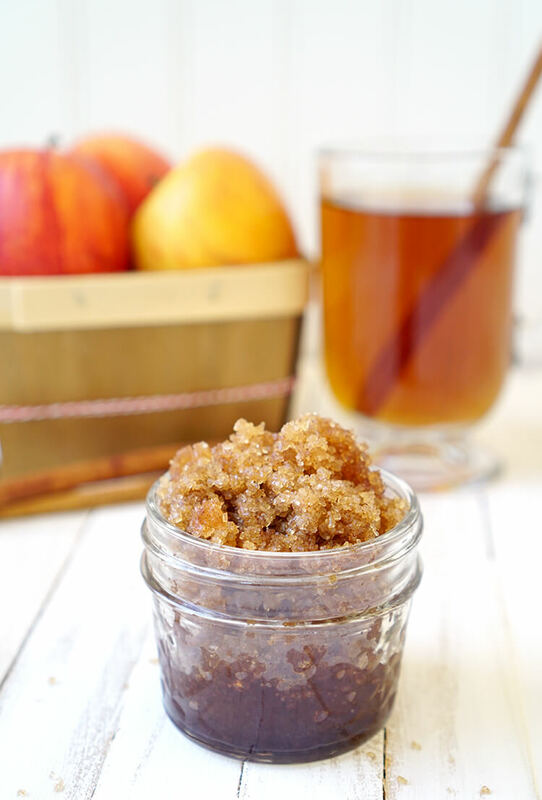 For my sugar scrub, I used a blend of Sugar in the Raw turbinado sugar and dark brown sugar. 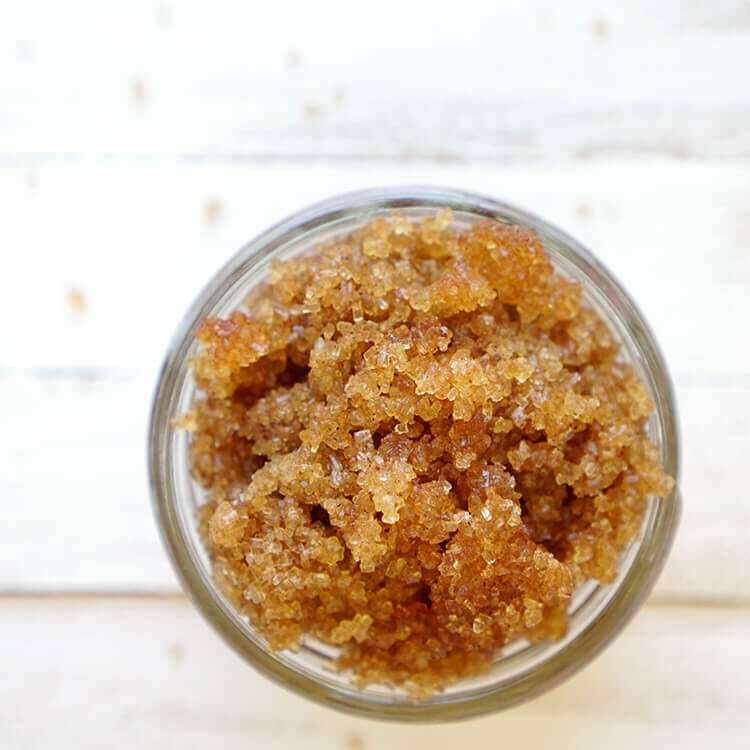 I wanted my scrub to have a slightly coarser texture from the turbinado sugar, but you can use any type of sugar or combination of sugars that you prefer. The brown sugar lends its aroma to the spiced apple cider fragrance, so I recommend using at least a 50/50 blend of brown and white sugars. Mix all of the ingredients together, and you’re ready for the smoothest, silkiest, and yummiest smelling skin around! Note: if your coconut oil is solid (at temperatures below 76 degrees), melt it in the microwave in 15-second increments until it becomes liquid to more easily mix the scrub. It’s perfectly fine if the oil in the scrub solidifies again after the initial mixing – heat from your hands and the shower will melt it again as you use it! 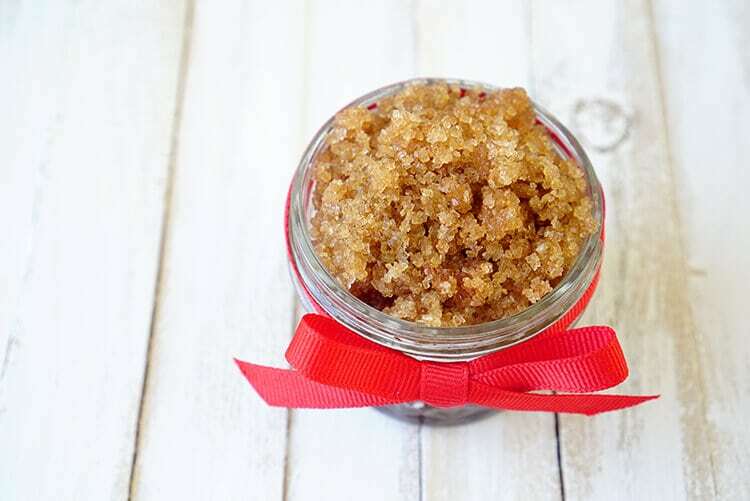 Add a sweet ribbon bow, and this sugar scrub would make a perfect hostess gift for the upcoming holidays! Easy peasy! 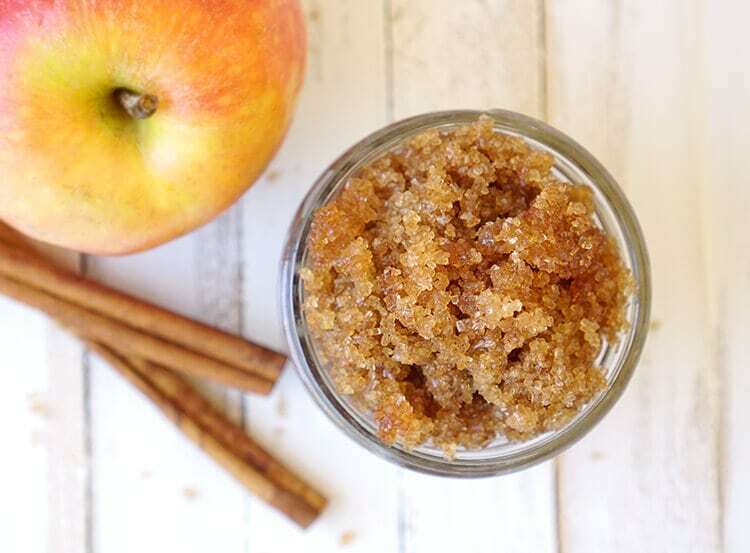 This spiced apple cider sugar scrub might actually be my favorite DIY fall-scented bath & body product that I’ve created so far – it smells AWESOME, and leaves my skin feeling vibrant and refreshed! 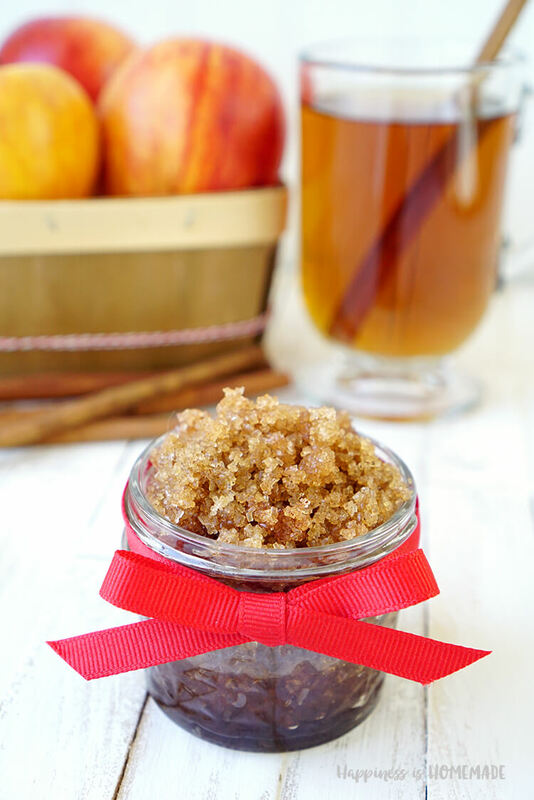 If you love the aromas of fall, you’re going to LOVE this quick & easy spiced apple cider sugar scrub! 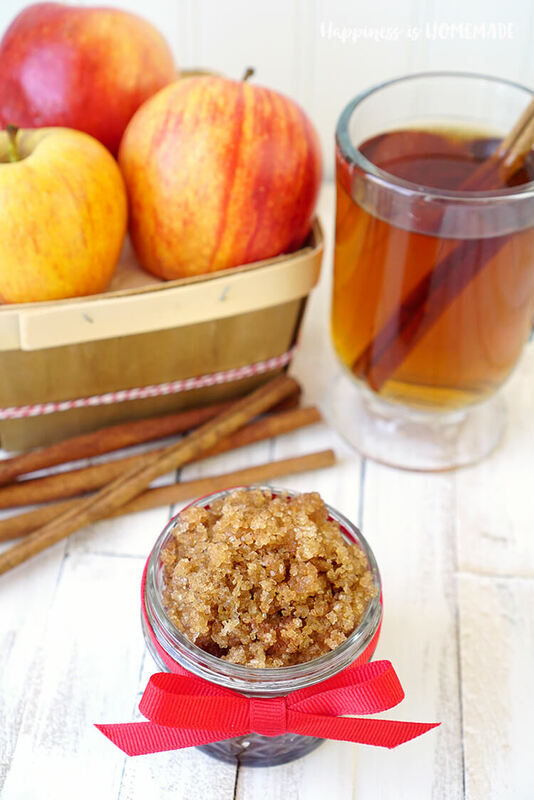 I was wondering would it be possible to use hot apple cider drink mix to add to sugar scrub, instead of other spices?? We made some up for a wedding shower , the them of our shower is falling in love . I would like to say it smells so good and made our hands so soft . My cousin Holly almost cried over an esty shipment that had not come in yet . Holly had ordered hand soap to give out to say thanks from our shower to yours . Will found out today 9,14,2017 that the order had never left NY. The shower is three days away . Holly gets to my house and i have found you and your scrubs what a blessing . 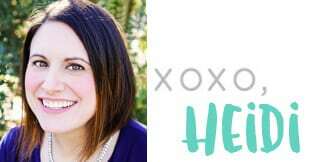 The ironic thing about this story is that my name is Heidi two. This was a sign that her plans would still work,( From our shower to yours). This was even better gift . Holly and I Heidi Joanne would like to say thanks for coming up with the scrubs ,now our shower Thank yous will always have a special meaning to us . Thank you so much from Holly Stack and Heidi Joanne Gaines PS we cant wait to give them out .